Facilitate means to "make easier." 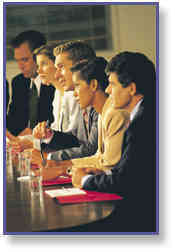 A meeting facilitator "makes easier" the work of a group by helping its members interact more effectively and productively. Traditionally, the facilitator does this by focusing on process, freeing the participants to concentrate on the substance of their meeting. Within this very general definition, facilitators assume a broad range of roles--from moderating a discussion during one portion of a short meeting among a handful of participants, to designing and conducting long-term, multi-meeting activities. We provide professional facilitation services for meetings of all kinds, large and small, cohesive groups or disparate, contentious groups. The work of the facilitator is to help the group get the work of the group done, despite any interpersonal issues or group dysfunctions. For us, facilitation is a set of skills, essential skills, that are only successful if utilized within the context of a broader understanding of group dynamics and the ability to keep one’s own agenda entirely separate from the group’s. The ability to stay neutral and to stay focused on the group dynamics rather than the content being discussed are the two most essential abilities of a professional facilitator.